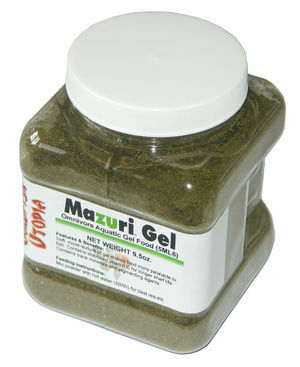 Mazuri Aquatic Gel Diet - 5ML6 - Omnivore Aquatic Gel. Sinking Gel food for omnivore fish. Vitamin K, vitamin D3, vitamin E, vitamin A, vitamin D3, riboflavin (B2), thiamin hydrochloride (B1), niacin (B3), pantothenic acid (B5), folic acid (B9), pyridoxine (B6), choline chloride, biotin, vitamin B12, Ascorbic acid. As this is a medium protein sinking gel food, it is especially good for older fancy goldfish (> 12 months) or balloon fish who may otherwise suffer from digestive problems. 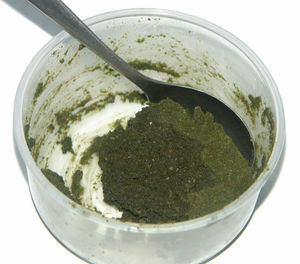 Try the 58LK version which has a higher protein level for younger fish. I tend to make up a 50:70 (Gel:Water) batch with boiling water (this ensures it sets) and this is readily taken by my fancy gold fish off the substrate and seems to cure the fish's constipation problem.